Clam Chowder. Traditional. Regional. Quintessentially American. From clam shacks and fine dining to secret family recipes, there are as many versions of clam chowder as there are cooks on the east coast, where there's also no shortage of opinion about what constitutes an "authentic" chowder. 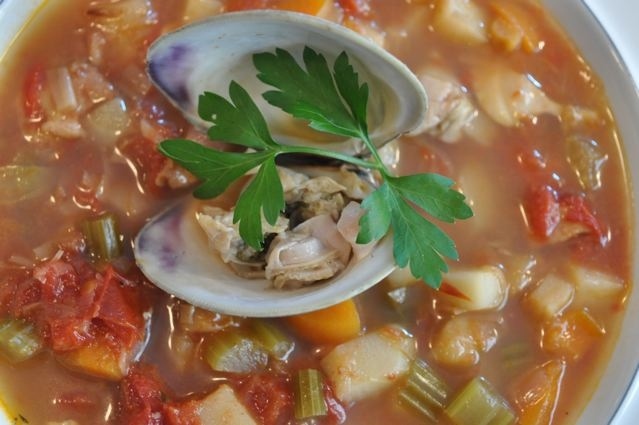 Made from local hard shell clams, also known as quahog clams, clam chowder is a popular summer dish from New York’s Long Island to the coast of Maine. Red vs. white? Pink vs. clear? Shuck the clams or steam them open? The controversy rages. No matter what type of chowder you favor – New England, which is a white chowder made with heavy cream, Manhattan, a red chowder that's tomato-based, Rhode Island which can be either clear made with fish stock or pink and utilizes both cream and tomatoes) --- it’s important that the chowder have layers of flavor that develop when you nurture the ingredients with good culinary techniques. This recipe uses browning, slow roasting and poaching in flavorful liquids to achieve its flavor and body. A good chowder, regardless of color, should be neither too thick nor too soupy. 1 carrot, diced into half inch pieces. Preheat oven to 350 degrees (F). 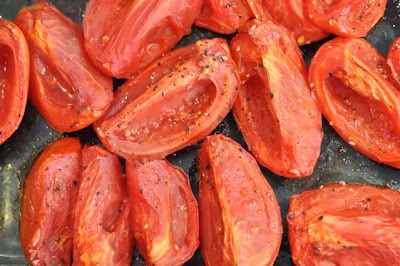 Cut each tomato lengthwise into 8 slices and remove the seeds. Trim the leeks so only the tender white and light green remain being sure to rinse between the layers to remove any sand or dirt. Dry the leeks. Spray a thin layer of olive oil in two roasting pans. Add the tomatoes to one pan and the leeks to another pan and spray the vegetables with a light coat of olive oil. Roast the leeks for about 20 minutes, until wilted. And, roast the tomatoes for an hour. Set aside. While the tomatoes are roasting, pull together the rest of the ingredients, including preparing a bouquet garni by wrapping the bay leaf, thyme and parsley in cheesecloth. Carefully scrub the clams to remove dirt and sand. Put the clams in a large mixing bowl and fill with water. Using a stiff scrub brush such as good quality vegetable brush, and vigorously scrub the clams. Discard the muddy water and replace with fresh water. Repeat several times until the water is clear. Remove clams from the water. Refrigerate until ready to use. Heat a large 4-quart sauté pan or 6 quart Dutch oven with a lid on medium-low, and slowly cook the bacon pieces about 8 minutes until crisp. Stir every few minutes so the bacon doesn’t burn. Take the roasted leaks and cut them into thin slices, about ¼ inch thick, and add to the cooked bacon for one minute. Remove the bacon and leeks and set aside. Using the same pan, deglaze the bacon bits with ½ cup of the fish stock and ½ cup of white wine over medium high heat. 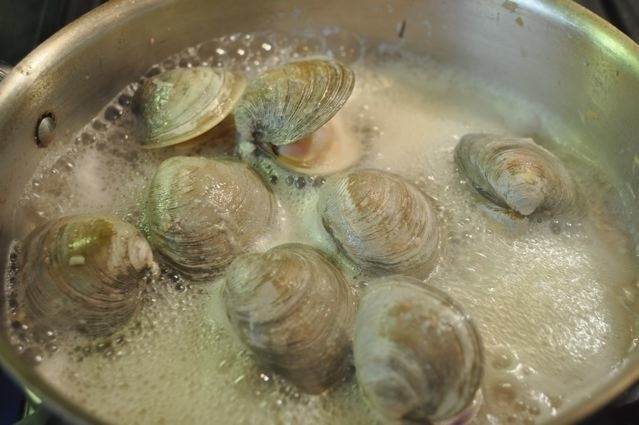 Add the clams to the poaching liquid and cover to steam them open. After three minutes, check the clams and working quickly move any open clams to a bowl and replace the lid on the pan to allow the steam to build up. Repeat every 60 seconds until the last clam is steamed open. Set aside to cool. Strain remaining liquid in the pan using a fine mesh strainer or coffee filter and reserve the liquid for the chowder. 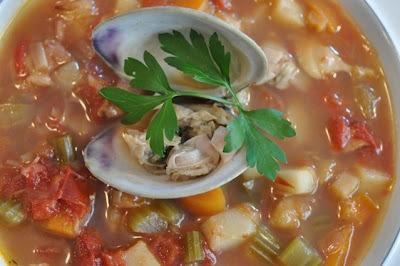 Pour strained liquid into the pan and add the remaining 3-½ cups of fish stock and bottled clam juice. Add the diced carrots and celery and the bouquet garni and heat to boiling. Reduce heat to an active simmer, cover with the lid and cook five minutes. While the carrots and celery and cooking, chop the roasted tomatoes into half inch pieces and add to the pan along with the crisp bacon and roasted leeks. Continue to simmer for 30 minutes. Remove bouquet garni. Add diced potatoes and cook until potatoes are tender but not overcooked and mushy or about 15 minutes. In the meantime, cut the clams into small pieces, being careful to reserve all the juices that collect on your cutting board. Mix the cut clams and the juices into the sauté pan to heat though right before serving. Garnish with parsley and a clamshell stuffed with some cut clams, if desired. Serve with French bread, organic saltine crackers, oyster crackers or the more traditional pilot biscuits (also known as hardtack or "sea biscuits") if you can find them.